The UPFA Government’s course correction over issues listed in the US resolution at the UN Human Rights Council in Geneva continues to pose critical challenges to it. Both locally and internationally, storm clouds are building. It is over one of the key elements, the conduct of the Northern Provincial Council (NPC) elections slated for the first week of September this year. At least officially, there is still no activation of any mechanisms for such a poll. This is notwithstanding periodic pronouncements by UPFA leaders at political events that the polls will be held. In fact, the date for such a poll has been suggested for September 7, the first Saturday of that month. However, this is not to say the Government has retracted from its position. There is still time for an official announcement despite growing apprehensions in Sri Lanka and abroad. There were other senior UPFA leaders who contended that such a Gazette notification was not necessary. This was on the grounds of a ruling by then Chief Justice Sarath N. Silva. It paved the way for the de-merger of the Northern and Eastern Provinces. They argue that the ruling acknowledged the existence of two separate Provincial Councils, one for the North and the other for the East. The two Councils merged together when Provincial Councils were established in terms of the New Delhi brokered Indo-Sri Lanka Agreement of 1987. It was viewed as the principal instrument for the devolution of power with the Tamil minority, predominant in the North and a third of the population in the East. If the Government’s plans are on track, the Commissioner of Elections will have to receive formal intimation by mid-June the latest to conduct a poll. That is in keeping with the two-and-half months he needs to make preparations. Such preparations will include planning afresh on locations for polling booths. During the separatist war which ended with the military defeat of Tiger guerrillas four years ago, the Department of Elections was forced to establish cluster booths and allow voters in one area to vote in another. Another is the positioning of staff, most of them with a proficiency in the Tamil language. The significance of Sampanthan’s remarks was further enhanced by a telephone call India’s External Affairs Minister Salman Khurshid made to his Sri Lankan counterpart G.L. Peiris. India, which used its diplomatic good offices to sway a decision in Sri Lanka’s favour at the Commonwealth Ministerial Action Group (CMAG) meeting in London last month has also become wary. Khurshid’s telephone conversation also centred on the conduct of the NPC polls. Diplomatic sources said he expressed India’s “serious concern” over moves by partners in the UPFA Government over twin issues. One was to go to Courts against the conduct of the NPC polls. The other was to exclude land and police powers from existing provisions in the 13th Amendment to the Constitution. These sources said India’s External Affairs Minister Khurshid “politely told” Peiris that any such measures by the Government of Sri Lanka would be “at its own risk” and would force the New Delhi Government to react with “firm measures.” He has also cautioned that Sri Lanka would be isolating itself in the international community. India, which secured an assurance from Sri Lanka that the NPC polls would be held in September, views such an exercise as the Government’s acknowledgement of the 13th Amendment. Hence, it is New Delhi’s view that the Government of Sri Lanka would have to implement the provisions of the Agreement and “go beyond it”, the same sources argued. Barely hours after Khurshid made the call to Peiris, the Indian Government went public on the issue — a step which shows the Congress Government’s strong displeasure with recent political developments in Sri Lanka. The move comes at a time when both Colombo and New Delhi were clearly on the road to rapprochement. As previously reported, Colombo had addressed issues of concern to New Delhi. This latest development, undoubtedly a fresh strain in Colombo-New Delhi relations, also throws light on another factor. The Indian Government was quick to go public on the fact that Sri Lanka has been put on notice. To this extent, it has made its response known to the media there. In marked contrast, Sri Lanka’s External Affairs Ministry continues to treat all such issues as ones that should be kept away from the Sri Lankan public. The silence was deafening. Hence, a veil of secrecy continues. This is notwithstanding claims backed by sections of the media that it was Minister Peiris’ diplomacy that led to CMAG (Commonwealth Ministerial Action Group) endorsing Colombo as the venue. More facts that challenge this view continue to emerge in the past weeks. Sampanthan’s own reticence is also underscored by the UPFA leaders informally sounding their partners and senior Sri Lanka Freedom Party (SLFP) members to amend the Constitution. The proposed amendments are to exclude land and police powers in the existing provisions in the 13th Amendment.The sounding out is to determine whether a two-thirds majority would be forthcoming. A call to delete land and police powers to PCs from the Constitution before the polls has been made by the UPFA partner, the National Freedom Front (NFF) led by Wimal Weerawansa. The NFF is also campaigning against the conduct of the polls. Next week, a fleet of vehicles will park in a Colombo location to collect signatures from the public asking for a cancellation of the polls. The vehicles will travel to all principal towns before a voluminous petition -something like an unofficial referendum — is handed over to President Rajapaksa. The NFF is also seeking legal advice to take the issue to courts to prevent a poll. The Jathika Hela Urumaya (JHU), as revealed last week, is embarking on its own campaign. It will also move courts. JHU’s legal advisor Udaya Gammanpila told the Sunday Times “our party will introduce a Bill in Parliament soon to repeal the 13th Amendment to the Constitution.” He said it was now being formulated. Amerasinghe said the JVP was not opposed to the NPC polls because one of its former stalwarts Minister Wimal Weerawansa was against it and was seeking exclusion of land and police powers. “We are opposed to it because there is no use conducting the polls without a new constitution,” he added. The JVP leader said the priority of the Government would be to restore civilian administration in the North, particularly after the military defeat of the Tiger guerrillas four years ago. He added that his party had not yet decided whether it would contest in the event an election was held. On the other hand, the main opposition United National Party (UNP) will field candidates though any alliance with the TNA has been ruled out by the latter. If the Government were to stick to its existing plans, constitutional amendments would become a knotty issue. This is for no other reason than being time bound. An NPC poll in September is a sine qua non in view of the assurances given both to India and Japan. It was re-iterated to India via diplomatic channels after the UN Human Rights Council voted on the second US resolution in March this year. Diplomatic sources said President Rajapaksa also told Japanese leaders during his visit to that country in March, just ahead of the UNHRC sessions, of his plans to conduct NPC polls in September. Thus, the international community at large would watch this ‘assurance’ materialise ahead of the Commonwealth Heads of Government Meeting (CHOGM) in Colombo in November. Hence, any proposed Constitutional amendment would have to come as an urgent piece of legislation before mid-June, if the Government is to meet the time requirements of the Commissioner of Elections. It is relevant to note that two other important events are also slotted for September. One is the next meeting of the Commonwealth Ministerial Action Group. The other is the UN Human Rights Council sessions in Geneva where Sri Lanka will come up for debate. At both these events, the conduct of the polls will be a focal point. The UNHRC decided that the Office of the High Commissioner for Human Rights presents an interim report on the implementation of the second US resolution when it meets at its 25th session in September. The NPC polls have also drawn the attention of both the United States and Britain among others. On Thursday, US Ambassador Michele Sison held a lengthy meeting with TNA leader Sampanthan and other senior members at the party’s city office in Bambalapitiya. It came at a time when a new Assistant Secretary of State for South and Central Asia in the State Department was named this week. 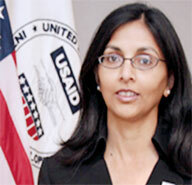 She is Nisha Biswall, an Indian American (not as a native Indian American though) who is at present Assistant Administrator of USAID. She has held that position since 2010. Earlier,she served as the majority clerk for the State Department and Foreign Operations Subcommittee on the Committee on Appropriations in the U.S. House of Representatives, which has jurisdiction over the State Department and USAID, as well as other aspects of the international affairs budget. She succeeds Robert Blake who is to be US Ambassador to Indonesia. Sampanthan said matters relating to the NPC polls were discussed at length. Among other issues discussed, he said, were human rights, media freedom, land issues in the North and East, Government’s implementation of LLRC recommendations, “militarisation” in the North and independence of the judiciary. “We spelt out our views on all these and other issues,” he added. With the official announcement that Prime Minister David Cameron and Foreign Secretary William Hague will attend the CHOGM in Colombo, the British Government has hurriedly put together its official position. In the absence of Premier Cameron, who was away in the United States, his deputy Nick Clegg fielded questions in the House of Commons. However, of much significance in this regard are letters Alastair Burt, minister in charge of Sri Lanka at the Foreign and Commonwealth Office, wrote to MPs Lee Scott and Siobhain McDonagh. Scott is the chair and Mcdonagh is the joint vice chair of the All-Party Parliamentary Group for Tamils in the House of Commons. In some of the electorates, Tamil voters have swayed decisions during polls. Hence, particularly the Conservatives and the Labour Party woo organisations representing them. That was how the current Government leaders were at the Global Tamil Forum’s annual event at the House of Commons in February this year and not last year as erroneously stated last week. It is clear from the statement that the British Prime Minister and his Foreign Secretary have declared they will take part in the CHOGM on the understanding that NPC polls will be held. In other words, the British Government has also put Sri Lanka on notice. Official accreditation of foreign journalists to cover the CHOGM is issued by the Commonwealth Secretariat in London. Already many media outlets in Britain including Channel 4, which has brought out two different controversial documentaries related to the military campaign to defeat Tiger guerrillas in May 2009, have planned to visit Sri Lanka. The Government will have no control in deciding which foreign media outlets will cover CHOGM though Secretariat officials in London will liaise with their counterparts in Colombo. Another is Burt’s admission in the letters that “there has been no widespread support for a change in location of CHOGM.” According to diplomatic sources in Colombo, he was alluding to last month’s CMAG meeting where members re-iterated that Sri Lanka should be the venue. As reported earlier, India had lobbied Commonwealth Ministerial Action Group (CMAG) member countries in Sri Lanka’s favour. In addition, Commonwealth Secretary General Kamalesh Sharma had successfully persuaded them on the grounds that a venue change could not be effected by CMAG. Now, Britain has made public the fact that it has accepted Government assurances that issues flowing out from the US-backed UNHRC resolution were being addressed. “Since we came to Government we have worked extremely hard to urge the Sri Lankan Government to improve its record on human rights. International pressure, including through support for the UN Panel of Experts, has borne fruit in persuading Sri Lanka to establish a domestic mechanism — the Lessons Learnt and Reconciliation Commission (LLRC), which reported in 2011. But without international scrutiny, and engagement, many of the recommendations of the LLRC are likely to languish unimplemented. “The British Government is determined that this will not be the case and we have consistently urged full implementation of the LLRC. We have led efforts to raise the profile of the situation in Sri Lanka with the EU, the UN Human Rights Council and United Nations. Using regular bilateral contacts and UK chaired “like minded” meetings in the margins of the United Nations General Assembly 2011 and 2012 we have sought to maintain awareness and pressure across the international community. “We co-sponsored the March 2012 and 2013 UN Human Rights Council resolutions on Sri Lanka lobbying for wide support for the texts which has put pressure on Sri Lanka to implement its own commitments and live up to the expectations of the wider international community. “As Minister responsible for our relations with Sri Lanka, I visited the country in February 2013, delivering clear messages about UK concerns in public and in private. “Some progress has been made in Sri Lanka on infrastructure development, demining, reintegration of ex-combatants and resettlement of internally displaced persons. However, we still have serious concerns about the lack of progress on reconciliation, accountability and respect for human rights, and the failure to implement in full the recommendations of Sri Lanka’s Lessons Learnt and Reconciliation Commission and the UN Human Rights Council’s resolutions. “In parallel with these diplomatic efforts, we have consulted our Commonwealth partners about the location of the summit and reviewed all the options available to member states. “It is clear that we are not the only country in the Commonwealth to have concerns about human rights in Sri Lanka. However, there has been no widespread support for a change in location of CHOGM, and there is concern that the Commonwealth itself — as an organisation which must serve the interests of all 54 of its member states — should not be damaged, weakened or undermined by divisions over the location of the Heads of Government meeting. “Having thoroughly assessed the merits of all the options available, the Prime Minister and the Foreign Secretary have decided to attend the meeting in Sri Lanka. “We will do so because of the importance of the Commonwealth to the United Kingdom and its other members. “We will attend the meeting with a clear message about the need for Sri Lanka to live up to the values of the Commonwealth, in particular to safeguard freedom of expression and the press, investigate and prosecute attacks on and disappearances of human rights defenders, protect minority rights (including those of both Tamils and Muslims), and uphold the rule of law and independence of the judiciary. “Ahead of the meeting we will urge the Government to hold the free and fair provincial elections which are vital to the long-term stability of the country. And we will make it clear to the Sri Lankan government that we expect them to guarantee full and unrestricted access for the international press covering CHOGM. This week’s developments make clear that despite CMAG, the upcoming Commonwealth Heads of Government Meeting (CHOGM) still remains uncertain. The UPFA Government will have to do a lot of tightrope walking. It is not an easy task since the rope will be an obscure one. Placating the international community will strain relations with partners of the UPFA. On the other hand, keeping the partners happy will, no doubt, internationally isolate the Government further. Must one say again that this is the heavy price Sri Lanka is paying for not having a cohesive foreign policy and allowing emotions and irrational approaches to guide it. In the latest instance, the glory of hosting CHOGM seems to have not only clouded the issue but allowed storm clouds to form. The coming weeks will show whether they will dissipate or grow in strength. The Tamil National Alliance (TNA) is awaiting a formal official announcement of the Northern Provincial Council (NPC) polls before making its position known. It appears to be reaching accord on a burning crisis within by reaching consensus to officially register the TNA. However, that will not be until January next year when the Commissioner of Elections will call for applications. Until then, the five-party alliance will go as Ilankai Thamil Arasu Katchi or the Ceylon Federal Party at least officially whilst functioning as TNA in other respects. ON THE TAMIL NATIONAL ALLIANCE: We are a political alliance of several Tamil political parties. We represent the Tamil people. We have functioned collectively as TNA. We have not functioned under the names of individual parties. Recognition for us, either domestically or abroad has come as TNA. There have been requests that the TNA be registered as a political party. It is not an unreasonable request. There have been some apprehensions about it which are also not unreasonable. All this had to be managed politically. We are, therefore, considering alternative ways to overcome this situation and to continue to function together. It is fundamental in the interest of the Tamils who have reposed their confidence in us. Certain persons who are interested in promoting disunity and damaging the interests of the Tamil people are creating mischief. We will not fall victim. We should be able to resolve this issue in a manner acceptable to all. WILL THE DISPUTES BE SETTLED BEFORE NPC POLLS? – I cannot comment on the polls. It has not been announced officially. I do not want to talk about it. I can, however, say that the registering of a political party cannot take place until January next year. BEING REMINDED THAT PRESIDENT RAJAPAKSA HAS DECLARED PUBLICLY THAT POLLS WILL BE HELD: I don’t know. He has said that in 2010, 2011 and 2012. An official announcement of the NPC elections per se has not come. Even the Commissioner of Elections has said at a news conference he is unaware of the NPC elections. WHEN NPC ELECTIONS ARE OFFICIALLY ANNOUNCED? – Our alliance will take a decision. Bear in mind that we contested the Eastern Provincial Council (EPC) elections. CHANGES TO 13TH AMENDMENT TO THE CONSTITUTION: I do not think such proposals will be in the best interests of the country. All governments have made efforts to improve on the present Constitution. It will be a folly for any government to think in terms of even reversing the existing constitutional arrangements. The All Party Representatives Conference (APRC) and the Multi Ethnic Experts Committee took steps towards advancing the Constitution. However, I do not want to comment on reports of possible amendments to exclude land and police powers.